Station Hollywood: Who was a bigger Phenomenon Raj Kapoor or Dilip Kumar? Who was a bigger Phenomenon Raj Kapoor or Dilip Kumar? Raj Kapoor versus Dilip Kumar. 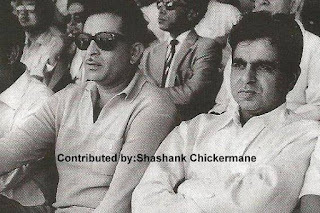 Raj Kapoor and Dilip Kumar had remained the greatest legends of hindi cinema for the last 100 years. Ranbir Raj Kapoor, also known as Raj Kapoor, was the son of legendary actor Prithviraj Kapoor. Muhammad Yusuf Khan, also known as Dilip Kumar was the son of Fruit tycoon Lala Ghulam Sarwar. Raj Kapoor was born on 14th December, 1924, while Dilip Kumar was born on 11th December, 1922. They acted together only in one film titled Andaz in 1949, which was directed by Mehboob Khan. There were a lot of striking points of the two superstars who ruled bollywood films during the 40s, 50s and 60s. 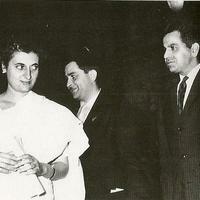 Raj Kapoor was awarded Padmabhushan in 1971, while Dilip Kumar was awarded Padmabhushan in 1991. Raj Kapoor was awarded Dadasaheb Phalke in 1987 and Dilip Kumar was awarded Dadasaheb Phalke award in 1994. In 1947, Raj Kapoor acted opposite Madhubala and Begum Para in the film Neel Kamal. In 1947, Dilip Kumar acted in the successful film Jugnu, although he started his career with the film Jwar Bhatta in 1944. While Raj Kapoor got the title of showman, with his projection of larger than life romantic stories in films like Barsaat, 1949, Awaara, 1951, Shree 420, 1955, Sangam, 1964, etc; Dilip Kumar got the title of Tragedy King with his projection of the sad personality in films like Devdaas, 1955, Musafir, 1957, Madhumati, 1958, Mughal –i-Azam, 1960, etc. Both the actors acted opposite leading actresses of the golden age including Nimmi, Nargis, Meena Kumari, Madhubala, Wahida Rehman, Vaijayantimala, to name a few, although Raj Kapoor acted in 17 films opposite Nargis, while Dilip Kumar acted in 7 films opposite Vaijayantimala. While Raj Kapoor at an age of 22 years married Krishna Kapoor at an age of 16 years who was his maternal cousin in 1944; Dilip Kumar at an age of 44 years married Saira Banu at an age of 22 years in 1966. Both Raj Kapoor and Dilip Kumar supported the Congress, but although Raj Kapoor did not join active politics, Dilip Kumar became Member of Rajya Sabha and also Sheriff of Mumbai. 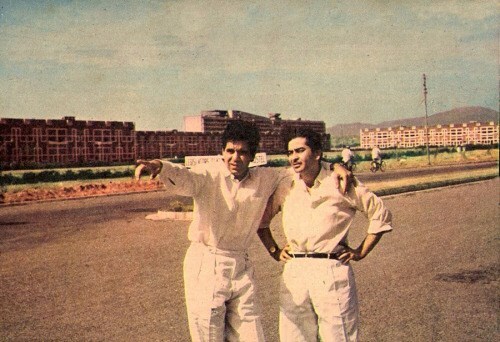 While Raj Kapoor had marathon combination with composer Shankar Jaikishan, lyricists Shailendra and Hasrat Jaipuri and singers Mukesh, Lata and Manna Dey, who worked with him in more than 15 films; Dilip Kumar had immortal bond with composed Naushad, lyricist Shakeel Badayani and singer Mohammad Rafi who had contributed in more than 15 films of the legend. While Raj Kapoor won filmfare awards in different categories including best actor, best director, best producer, etc; Dilip Kumar won the filmfare award for best actor for record 8 times. Raj Kapoor had died in 1988 and Dilip Kumar had retired from films after acting in the film Qila, many years ago. Their works should be preserved and restored.